Based on the instruction booklet (see page 6 for a finished example of a frame) design a frame that you will attach all your pieces to for creating your roller coaster. -Your roller coaster will need to fit through a doorway and be able to handle being moved everyday in and out of storage. Because of this you need a sturdy base! -My suggested Base size is 12 3/4" x 22 3/4"
-With this size, columns can be mounted in the corners of the board and midpoints of the long edges, leaving exactly the right amount of space to attach beams without any trimming necessary. Gather other supplies, such as scissors, rulers, ball point pens, and enough rolls of tape so that each person or group has at least one roll. Use the instruction manual to learn how to build each piece. Practice making each piece so you’ll be able to explain it to your students. -The local amusement park has issued a challenge to roller coaster designers to determine who should build their next roller coaster. 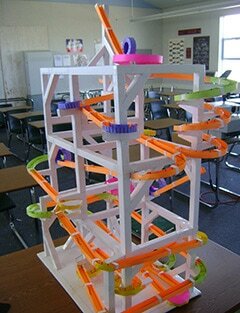 You’ll need to prove that you can make an exciting roller coaster that meets their requirements, using as little money as possible. 7. 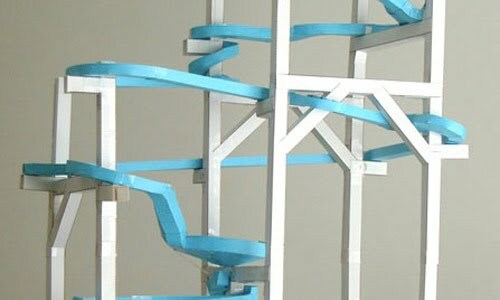 Must use at least 6 parts from the "Advanced Kit"
After you’re done building, we will test your Paper Roller Coaster by placing one marble at a time on it. 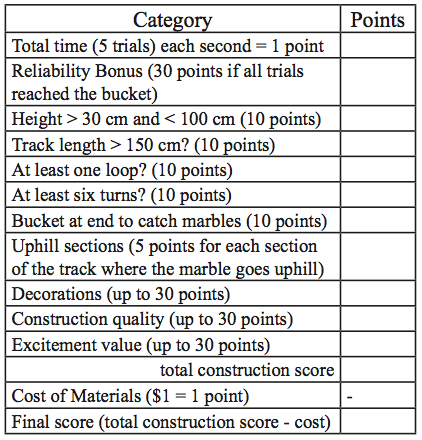 Record the amount of time that it takes for each marble to reach the bucket at the end of the track. If the marble gets stuck or falls off of the track, write N/A for that trial. Day 1 - Choose groups and beginning sketches and design for frame and rough idea of roller coaster. Think exciting! Day 4 - Start assembling frame pieces. It must be strong! ​Day 5+ - To be continued! Instructional videos for the ADVANCED SET and Help here! CLICK CLICK CLICK! !